I choose the above title partly because I will soon review a book titled “Evolution’s Purpose.” For now, though, let it describe what I may have done over the last couple of years as illustrated by this picture taken of me yesterday. I had carried a change of clothes to my post-op visit following last week’s knee surgery, but, as I changed, I noticed I had failed to bring a change of socks. 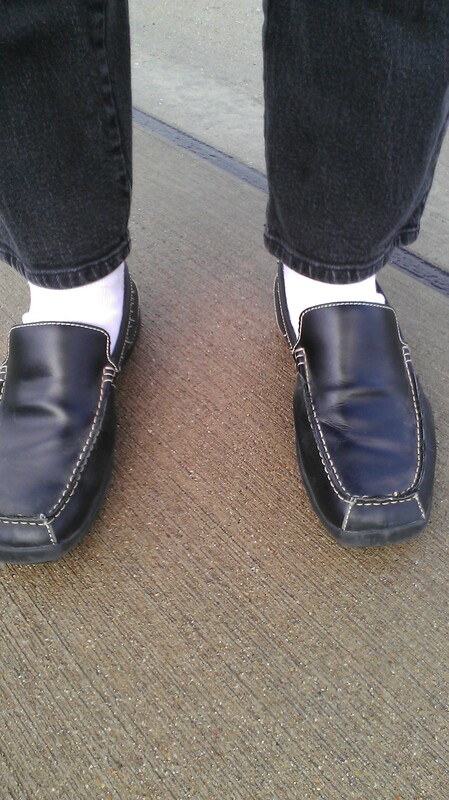 I spent the rest of the day in black jeans,black shoes, and white socks. My immediate thought was to hop into a store and buy a pair of black socks. That’s what I would have done in the past – ok, what I recall having done in the past under similar circumstances. Yesterday, though, I demonstrated maturity. As I have a drawn full (relatively) of black socks at home, it made little sense to buy more. I don’t think anyone was offended nor was my witness or ministry hindered by the Sock Problem. Perhaps I can continue to evolve in the same direction. I hope next time to remember to bring the requisite socks. I have two kinds of socks: white socks and black socks. That’s all the color complexity I can handle in that realm. Unfortunately, not all my black socks fade at the same rate.